When the Jesuits bought Beaumont Lodge through a legacy from Fr the Hon Joseph Constable Maxwell SJ, the brother of Lord Herries, from the executors of Lord Ashbrooke in 1854, it was a remote 18th century country house with a dairy and a walled garden, set among woods on slopes above the River Thames at Old Windsor. It had previously been owned by various peers and by the Duchess of Kent, the mother of Queen Victoria. Warren Hastings also lived there and it was the owner prior to Lord Ashbrooke who rebuilt the White House with a graceful formal colonnade of feathery pillars with elaborate capitals. The pillars are 36 feet high and lend the whole building its excellent, tall proportions. The architect, a Mr Emlyn of Windsor had previously worked on the restoration of St George’s Chapel for King George III. The building was surrounded by very large lawns and lawn-like fields lying behind it, fringed by woods that adjoined the Great Park on one side. The whole was overhung from a distance by the Beeches, a hanging line of trees balanced along the hill-top which constituted the upper boundary of the estate. A fringe of casual looking big-bosomed trees that used to frame the core of the White House from the river were thinned away in time to reveal the naked cross-purposes of later architects. This was the house chosen by the Jesuits for a noviceship near London. The Oxford movement and its results had turned the thoughts of English Catholics more towards the centres of national life from which their religion had so long cut them off. The foundation of the school was to counter those that felt the Jesuits were out of date and un-English. Stonyhurst, their establishment in the north of England, had a tremendous reputation at the time and a fine tradition of classical teaching. However, it was though, fortress Catholicism as was the Benedictine tradition of Ampleforth and Downside. Beaumont was to answer this with a more relaxed country house approach. It was certainly going to be different from those schools that already existed, or that were being founded at the same time. The Jesuits were if anything secretive about their purchase and their intentions which some would feel, was living up to their reputation. The inspection was carried out by a priest in the disguise of a visiting gentleman. 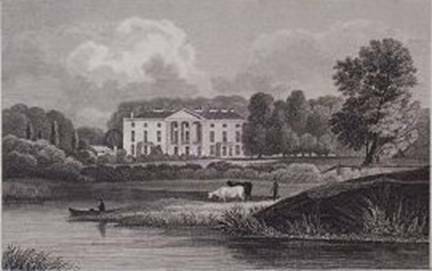 At the time, they felt that the people could accept their Order out in the wilds of Lancashire but it was another matter altogether for them to be close to London and in sight of the Royal residence at Windsor. Their concern for the anti-catholic feeling was understandable and the necessity to keep the whole affair secret, rather than risk interference from either rabble or from high political quarters. The foundation of Beaumont and many of the best things in it, including its whole curious and stable mixture of public leisure and individualised industry, belongs to the late Victorian age. This was exemplified by the cricket flat, which was a very beautiful one in a setting of woods above the school with its superbly elegant pavilion having a curved roof and pillared arcade. On a ledge of the hill above this pavilion and separated from the school fields by a narrow valley, and facing askew across them towards Windsor, stands the preparatory school St Johns; it had been part of the main school up until 1888, when it then moved to its own accommodation which is a small masterpiece by Bentley, later the architect of Westminster Cathedral. View from Magna Carta Island towards the site of the Beaumont Pitches. Overall, the essential local character of Beaumont, where the buildings are one of the minor excitements of a relaxed and unpretentious landscape, subdue themselves to the river. The lower Thames, too tame to dominate even its tame surroundings, moves through them like an ageing and purposeless divinity, shabbily creating as it goes with all those meadows, ragged hedges, the mists and sinuous variations which are epitomised in adjoining Runneymede. Although never part of the estate, the school used those green swards of the north meads for pleasurable pastimes from the outset, and later in the 19th century for games and sports that continued till its closure. 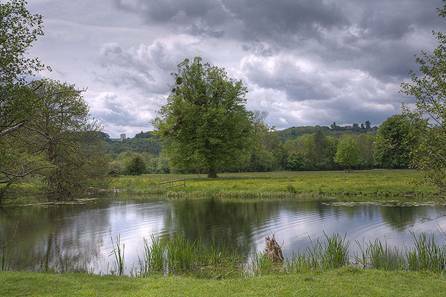 Long before Charles Barry built the Palace of Westminster, the crucible of our democracy was considered to reside in an unassuming meadow some twenty-five miles from London. If King John and his Barons had gathered there for the signing of Magna Carta, it was also the site of spirited games of football and then Rugby; the Beaumont playing fields were on the most historically important turf in these Isles. Once it was decided that a school rather than a noviceship was required, the concept was that it should remain small; there were less than 100 for most of the 19th century and there were only sufficient numbers to change from football to rugby following the Great War. The size did increase over the years and by the time of closure there were in excess of 250; only some four thousand pupils passed through Beaumont in its existence. Any school opening its doors for the first time has to find its pupils from somewhere and the Jesuits at Beaumont were not going to accept them from just anywhere. Beaumont was to meet the aspirations of the upper strata of society both British and from abroad. The proximity of the capital would appeal to those coming from the continent or further a field. The international aspect of the school, alien to many at the time, was to make Beaumont unique compared to any other establishment. From its beginnings, boys arrived from all parts of the globe including the Americas and Australasia. In 1861, Beaumont College dedicated to the young Saint – Stanislaus Kostka opened with two sorts of pupil. There were those arriving for their college education and a few were philosophy students when places at Oxford and Cambridge were still practically impossible to find for Catholics. There were only four boys present in the first term and by the end of the school year of July 1862 numbers had only increased by another twenty. It was also the year that the Clarendon Commission was set up to look into the deplorable state of the Public Schools. Apart from regulating the physical conditions in these establishments, it enshrined the role which was to create a class regardless of social, ethnic or religious origin and create a new aristocracy. Emphasis was to be on the classics, philosophy and history together with robust religion; science was not considered a subject worthy of young gentlemen. At Beaumont, they begged to differ and despite the lack of facilities they appointed Prof. Barff in 1864 as science master, later he was professor of chemistry at University College London. It stressed again that Beaumont was not going to follow mainstream thinking of the day. 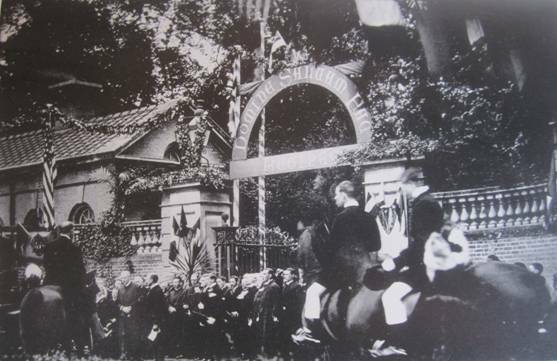 The event which set a seal on the existence and nature of the College was the first visit of Queen Victoria in 1882, twenty one years after its founding. Beaumont was enjoying a period of “crazy grandeur as well as vernacular eloquence, which nothing so happily expresses as HM’s visit; the first personal recognition of a Catholic school by a sovereign, since Henry VII, as a young man, confirmed the privileges of Eton”. Later on that same year, the Queen’s youngest son Prince Leopold brought his bride out for a visit and the Queen drove around unofficially to see the decorations. She was to make two more formal visits to the school in 1887 and ’97. This first royal favour brought about acceptance of the school’s existence from Eton. It was said that the first challenge to a game of cricket had been met with the response “Harrow we know, Winchester we have heard of but what is Beaumont” to which the reply had been “Beaumont is what Eton was, the school for Catholic gentlemen”. Whatever the truth of the matter, the two headmasters dined together and Eton became the school’s oldest adversary on the playing fields and the river. 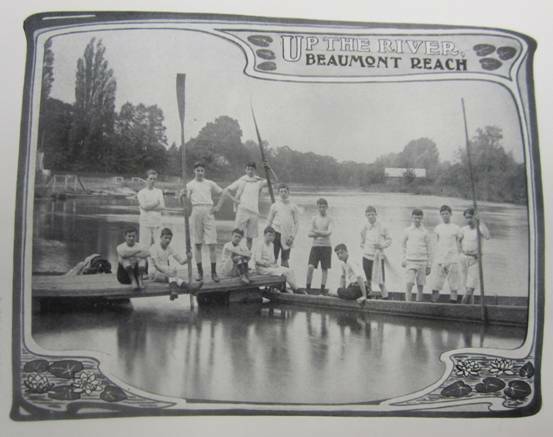 Once transport became less of a problem then the Oratory School founded by Cardinal Newman became Beaumont’s main sporting rival. 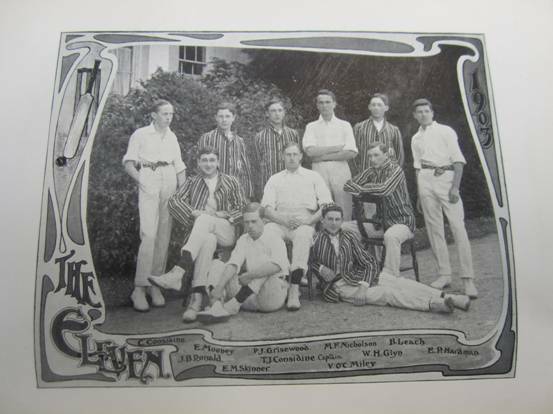 In time, when the cricket match between the two at Lords was introduced, the College was able to claim that with Eton that they were the only schools to play at the home of the MCC and to row at Henley Royal Regatta. Unlike similar schools, Beaumont with Stonyhurst was not organised in Houses except occasionally for games. The boys were kept in Lines of their own age group with those under sixteen in the Lower line of 2nd and 3rd playrooms and the senior boys in Higher Line. Discipline was maintained by the Head of the Line which later evolved into a Captain’s system assisted by monitors. Apart from physical chastisement by the appointed masters with the ferrula, the Captains were also able to dispense corporal punishment with the cane but there was no fagging system in the school. You were never beaten by the person who ordered it. Dress evolved over the years with formal tail coat or “Etons” being “de rigueur” up until the Great War and thereafter on Sundays or special days till the Second War. In the post war period, morning dress was worn by Captains for the Corpus Christi procession but otherwise suits were worn. Informally, the move was from Norfolk jackets to hacking or sports jacket with blazers coming into vogue at the turn of the 19th century. The standard one was blue but those awarded sporting colours wore a jacket in the appropriate hue and lacing of “Windsor brown, Cambridge blue and Oxford blue”, The exception being the cricket “pyjama jacket” of narrow stripes and the white Henley blazer. Headgear altered from the silk hat to caps and boaters. Dress privileges and customs were numerous to include collars turned up, the colour yellow, cravats, waistcoats and hands in pockets. At times, it was difficult to find uniformity within the school and the hierarchy was complex. Beaumont had its own pudding known as Menchikoff. It was made up of slices of sponge cake soaked in sherry with a filling made up of sweet almonds, egg yolks, butter, sugar, vanilla and an ample amount of whisky, cover with more sherry soaked sponge, weighted and chilled overnight; it was served on special occasions. The school tuck shop served a concoction “Fling or Pepsi Specials” where a fizzy drink was added to ice cream and drunk through a straw. OBs have been known to make a similar “mixture” with champagne. There had been a farm attached to the school from its earliest days and initially provided fare for both masters and boys but as numbers increased it could not match what was required on a large scale. 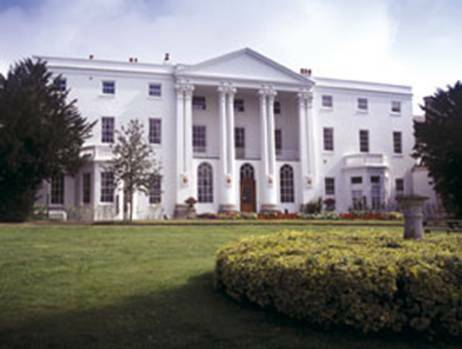 The farm became known for its prize winning pedigree herd of Guernsey cattle and indeed the first sight for those visiting the school were cattle grazing in the meadow below the White House. One parent was to comment that, “Apart from the boys, there were geese in the playground, pigs in the orchard, turkeys on the lawn and cows everywhere". For scholarship, the school was organised into three streams depending upon your assessed ability. The standard in the school ranged from abysmal at a period in the 19th century to creditable in its last days. For a school, not recognised as a great seat of learning, it produced two Nobel Prize winners (chemistry and physics) and many exceptional academics, physicians and lawyers. It was the schools good fortune to engage various masters of exceptional ability and apart from Frederick Barff, they including the socio-political theorist Erik von Kuehneelt-Leddihn and the classicist Arthur Armstrong the foremost authority on Plotinus. Among the Jesuits was Charles O’Hara, the mathematician who tutored Sir Anthony Leggett OB and Bernard Lonergan, one of the most important thinkers of the 20th century. The College was fortunate to hold some exceedingly rare medieval manuscripts and books donated by Fr Henry Campbell in 1874. These formed the basis of the library that bore his name and included among these were the Kirkstead Psalter circa 1300, the XVth Century Booke of Good Condicions, The Abbey of St Denis and the Kings of France circa 1495 and a XIIIth century Vulgate Bible. A later addition was a hand written Koran belonging to Muhammad Ahmad known as the Mahdi and responsible for the death of General Gordon. 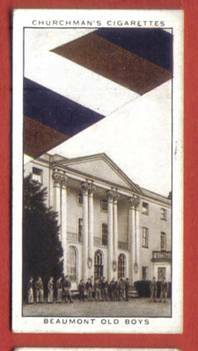 During the Second War, The Brothers Walk within the grounds was hit by a 1000lb bomb and much of the glass in the school was blown out; the building had probably been mistaken for the Royal Lodge and the White House was then camouflaged grey. The College also offered sanctuary to the Cardinal Vaughan School from London which caused more administrative difficulties and was bedevilled by a greater complexity of cross-purposes than any other single undertaking since 1861. The School had a thriving Scout Group and societies and clubs to suit most tastes. These ranged from the literary Quodlibiterians with their own journal “Vril”, Debating based on the parliamentary system, Music in all its forms including “Glee” and Scottish Dance. With London so close, there were outings to Covent Garden for both opera and ballet or the Savoy theatre for Gilbert & Sullivan. Photographic had its own dark room and there were facilities for both carpentry and electronics. Being a Jesuit establishment, Beaumont had an association of the Sodality of Our Lady which aimed at fostering devotion, reverence and love for the Mother of God. All these activities were recorded in the “Review” that was published three times a year and sought a compromise between a chronicle of events and the social chitter-chatter of the old style Tatler. To mark the centenary of the school, a new accommodation block was built and was one of the last designs of Sir Giles Gilbert Scott and a larger boathouse by the architect Thomas Bedford. It was also announced that HM the Queen would visit some sixty four years after the last visit by Queen Victoria. At the end of which she was to say that “Beaumont is the most un-institutional establishment I have ever visited”. Beaumont was a Jesuit school and as such came under the control and responsibility of the Order with their headquarters in Rome. 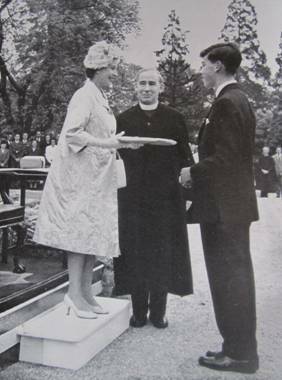 With the number of vocations in the English Province falling in the post war period and a redirection towards missionary work being given priority, a saving had to be found. An independent assessor from Rome considered that Beaumont both small and exclusive should be sacrificed and the school closed. The announcement made in 1965 was badly handled and a public relations disaster particularly following on the fund raising for the new buildings in the centenary year and the good academic standard at the time. The College finally closed its gates in July 1967. This was built to a design by Joseph Hansom, a man from a family of architects, who was part of the Gothic revival movement. His accepted proposal for Beaumont though was Romanesque. He worked for a short time with Edward Pugin but is best known as the inventor of the horse-drawn cab that bore his name. The Beaumont chapel was built in 1870 and the stained glass including the Holy Ghost rose window was by Hardmans responsible for the numerals on Big Ben . 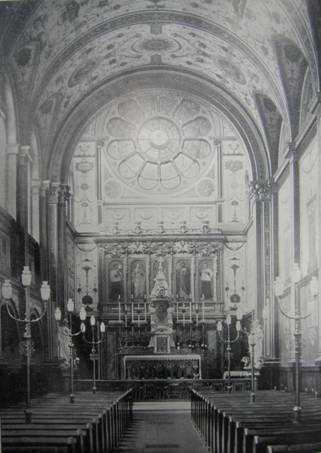 The chapel was redecorated in 1902 with “astringent but lavish richness, clear colours and classic pretensions”. Romaine Walker, a socialite designer who had recently given Her Majesty’s Theatre a make over was commissioned to produce the latest and most dazzling of the elaborate styles of classical wall-painting discovered in the then recent excavations of Pompeii. The complete work has been described as an eccentric and extravagant small masterpiece and the first beautiful interior ever designed for an English school chapel. It was said to have been the inspiration for the Marchmain’s chapel in Evelyn Waugh’s Brideshead Revisited. 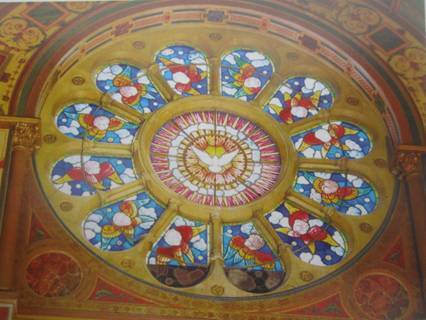 The Rose window was destroyed when a V1 rocket landed on the Bells of Ousley public house between the College and the River in 1944 which brought down most of the glass in the school buildings; it was replaced at the end of the war. The Six massive brass candle holders were donated by the Castel-Branco family, noble descendents of Blessed Charles de Spinola SJ martyred in Japan in 1622. 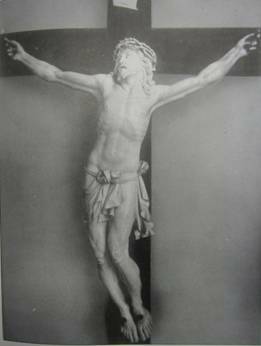 The Lady Chapel altar and the Beaumont Ivory Crucifix, with Christ’s body carved from one huge tusk were the gift of the American Mrs John Mackay, wife of the wealthy industrialist who had them imported from France. 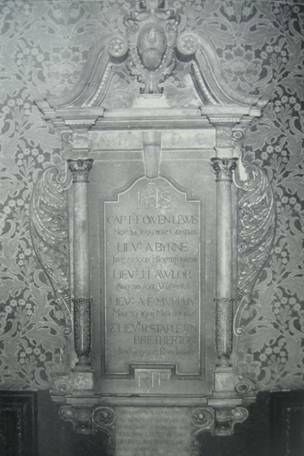 The memorial for the five OBs killed in the Boer War 1899-1902 is an elaborate cartouche attached to the wall in the Lower Line refectory. It was to a design by OB Giles Gilbert Scott who at twenty three had just been commissioned for the new Liverpool Cathedral. It was unveiled by Field Marshal Sir Evelyn Wood VC apparently in an “atmosphere of brilliance and gaiety”. It was blessed by the Cardinal Archbishop of Westminster who was present with a bevy of catholic society. There was a military band and the pipers of the Scots Guards. Some 110 OBs served in the war, the largest contingent from any of the Catholic Schools. 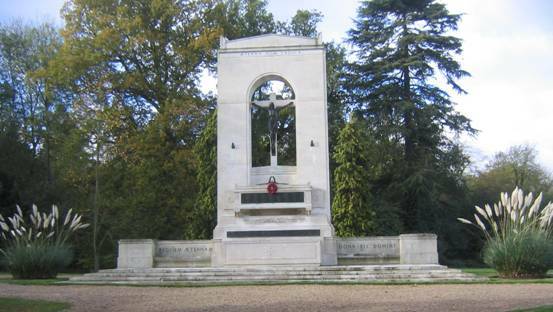 It is considered to be one of the most beautiful in the country and consists of an arch of Portland stone containing the life size bronze cross of Christ crucified with the names of those listed on panels below, this mounted above an altar, itself the symbol of sacrifice. The setting is within the peaceful park landscape of the College grounds. It is the collaborative work of both Giles and Adrian Gilbert Scott and was unveiled in 1921 by General Sir George MacDonogh OB in the presence of Cardinal Bourne Archbishop of Westminster. Of almost 600 OBs eligible to serve, 132 gave their lives. These include a father and son, 7 sets of brothers, and numerous cousins. There were six Frenchmen and two from the United States including Harry Butters the first American to join the British army to fight in the conflict; his sword was made into a crucifix for the Lady Chapel. On the Second War panel added in 1948 are a further ninety names, the majority air force fighter pilots and bomber crews. There are five Americans listed and three who served with SOE and the French Resistance. It was completed in 1882 and is believed to be the first indoor heated school pool in the country. It never occurred to the designers that it should be anything else but a place of beauty with its classical style, decorated ornamental tiles and solid-looking woodwork that recalled the Regency. Beaumont played Association Football from 1881 up until 1918 when numbers eventually allowed a switch to the more popular rugby. At Cricket, one of the earliest matches was against Viscount Downe’s XI, an English cap and future president of the MCC. In the series with the Oratory at Lords, Beaumont ran out the overall winners by five matches. Boating was the oldest school activity commencing in 1862 with the launching of “The Flower of Beaumont”. 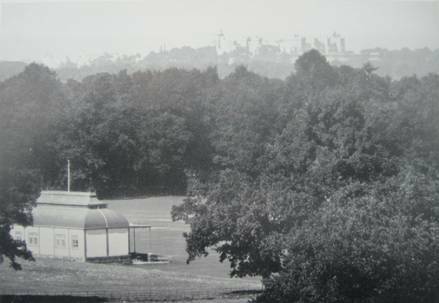 The VIII first competed at Henley in 1913 and still holds the record for the highest rate of stroking at 40 over the course set in 1957. Boxing was the most successful individual sport which had become legal in 1901 and then came under the auspices of the Army. Following the Great War, it was split into societies of four schools each. Beaumont boxed with Bradfield, Charterhouse and Wellington. There were to win this competition three times in a row. The school produced several Service and Combined Service champions as well as those at Oxford and Cambridge. Unlike at other schools where matches took place in the gymnasium, at Beaumont they were in the theatre on a raised dais. The riding school that continued till the First War also came under military scrutiny and the boys were encouraged to ride to hounds. As a team, Beaumont’s best achievement was at ice hockey when they formed the first junior side in the country. There were to win the Queen’s Competition from 1935 to’37. There was also squash, hockey, fencing from time to time and tennis though normally “with” rather than “against” female teams from nearby convent schools. Athletics, one of the oldest of activities, took place only on grass with cross-country runs to the Copper Horse in the Great Park. There was also the possibility of “water runs” when and if the Meads flooded. Grand Matches or Beaumont football was played regularly for the first twenty years but had died out by the end of the 19th century. Nominally the game was played between the English and the French with appropriate national anthems sung before and after the games. Play was highly individualistic; there were few tactics, little regard for life and limb, one’s own or anyone else’s. There was no passing and if one got the ball, one tried to score oneself. All that mattered was personal honour. The game would last for two hours with short breaks every half an hour sounded by gunfire from the school canon. Goal scores received a glass of port at a dinner in the evening. The ethos of team spirit killed off what was considered an admirable game. During the school’s existence there were the colonial wars of the late Victorian period culminating in the Boer War and in the 20th century - two world wars and other conflicts; the majority of Old Boys spent time in uniform. The origins of the school Corps go back to the 1870s and the Victorian ethos of that period. A group of boys took to drilling as an unofficial pastime and a drill sergeant was hired at £1 a day to come twice a week. A forerunner of the field day took place in 1879 which was recorded as “a series of sanguinary sod- fights”. 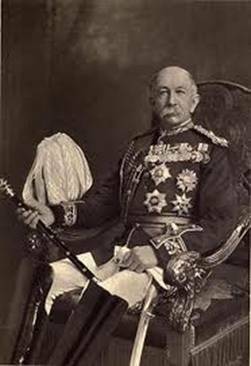 It was not until 1905, through the auspices of Field Marshal Sir Evelyn Wood that the Corps was made official and was affiliated to the East Surrey Regiment. They were equipped with wooden rifles; later they were issued with Lee-Enfield rifles and Martini carbines. 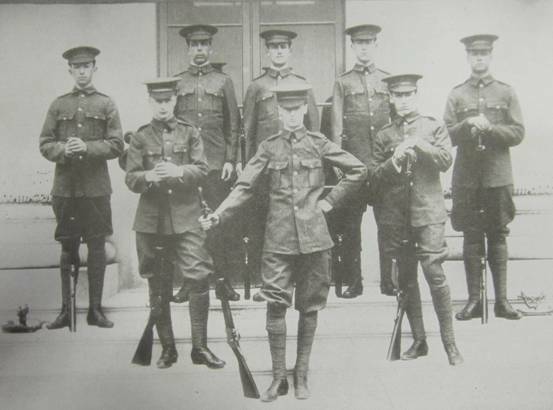 After the Great War, The Corps became a part of the OTC and the boys were expected to buy their own uniforms which included a distinctive scarlet stripe on the trousers. The officers were mounted when on parade and the Colours were trooped each year. With the outbreak of WW2, The Corps formed part of the Home Lands Battalion responsible for the Windsor Castle and Royal Lodge guards. On one occasion King George VI took the salute as they marched into the Castle forecourt. In recognition of their service, the King awarded them the right to wear the garter star which is the privilege of the Household Division and this was incorporated into the cap badge. The Corps became the only contingent affiliated to the Guards. Highlights during The Corps’ existence included the street lining at the funerals of King Edward VII, George V and George VI, and the Trooping of the Colour in the Centenary year. The Colours were laid up in the chapel in 1967. Commanding Officers Include; Fr Mayo SJ (His father won a VC), Viscount FitzAlan late 11H, Lt Colonel P M Roddy late Cheshires, Major T Kelly late IG & CSM of The Yeoman of the Queen’s Bodyguard. 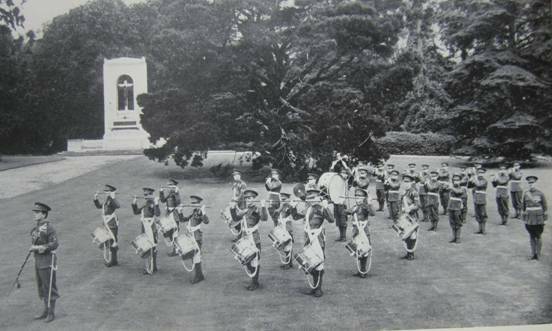 Ever since the official formation of the College Corps (1905), The Corps of Drums have existed depending upon the enthusiasm of the boys at the time. The Drum Major’s uniform with its stand-up collar and accoutrements is a “relic” of the Edwardian period but it wasn’t until after the Great War that the Band was officially recognised and new instruments acquired. These consist of drums (side, tenor and base) fifes and bugles. The leopard skin apron of the base drummer and the mace of the Drum Major are circa 1935 and the mace carries the names of 29 Drum Majors. Their most important parade was in 1939 when they played for the future Queen and Princess Margaret at Windsor Castle. Known as The CARMEN it was written by one of the early Rectors Fr George Kingdon circa 1870s and has six verses. It was usual to sing the PATER NOSTER following the Carmen to a tune that is particular to both Beaumont and Stonyhurst. The SONG OF THE VIII. Written at the turn of the 19th century by Fr Joseph Keating SJ and has seven verses. Get back quicker, mind the feather! *numbers variable depending on deserts. 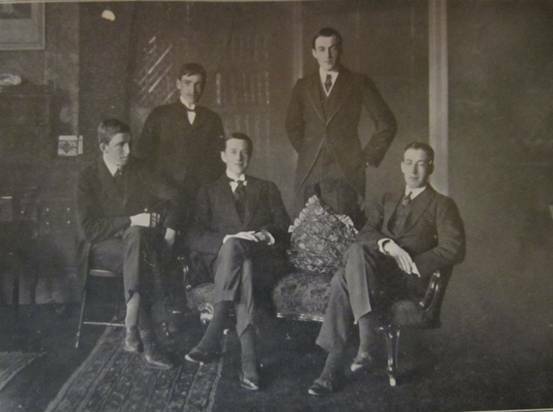 The association of the old boys known as the Beaumont Union was founded in 1877 with the first pupil Charles Roskell as Vice President with fellow committee members John Munster from the same legal firm, Fredrick Barff the barrister son of the first science master and Cyril Payne as “the purveyor of fine wine”. The role of President was held by the Rector of the day and over the years have included two OBs – Fr Sir William Heathcote Bt and Fr Sir Lewis Clifford Bt. Past Vice Presidents have included Frank 2nd Lord Russell of Killowen and Henry “Hal” Dickens grandson of the author. With the closure of the school the presidency passed to Leo Burgess another lawyer and Clerk of the Peace for the County of London. The title is currently in abeyance. The Union has held an annual dinner in London since its founding except for the periods of both World Wars. Venues have included many of the fashionable restaurants of the day but since the last War, the Hyde Park Hotel, the RAF Club and the East India Club have been used. In 1910, the Union were the guests of the Lord Mayor of London and OB – Sir John Knill Bt. The last dinner was held in 2012 when a decision was taken to move to an annual luncheon. The Union was famed for its theatricals and put on a play at the college every Shrovetide since its formation with again the exception of war years; it was a record probably unmatched by any other old boys’ association. The lawyers predominated with productions ranging from serious subjects such as Russian nihilism to farce. In one early play, Sir Mark Sykes not only wrote it, but also directed and took the leading role! Except for a public performance at the Arts Theatre London in 1932 to raise money for charity, ladies were not included in the cast. This changed in 1957, on the grounds that with the demise of the Deb season it would help to occupy their minds. The Centenary production of “Treasure Island” with a cast of over thirty was directed by Christopher Hewett who had been directing on Broadway and before his departure for Hollywood. The curtain finally came down in 1966. Until “new blood” was no longer available, the Union had various sports teams and societies. These included Rugby with their headquarters at the Bells of Ouzley Pub at the bottom of the back drive. 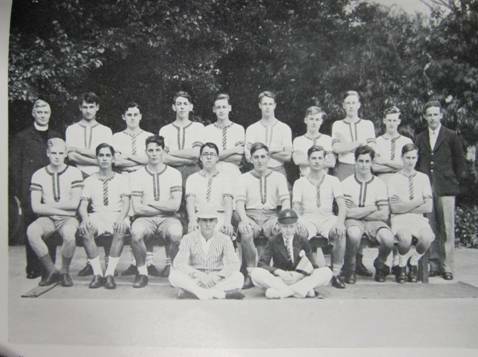 The Pilgrims Cricket side that played other old boy associations, but between the Wars would go on tour each summer and the Ocean Racing Club and in later years a squash team. The Union Golfing Society, apart from having their own annual meeting were one of the founders of the Halford Hewitt – their best result was winning the Plate competition in 1965. They also founded the Russell Bowl to be played against the old boys of Ampleforth, Downside and Stonyhurst. The “Beaumont Review” in a similar style to that produced during the life of the school but now in the form of a newsletter has continued. With the advent of the Worldwide Web, it has mainly been superseded by the advent of this SITE in 2013. “Unfurl my Beaumont blazer before I pass away”. The Carmen Beaumontanum as I am laid below”. Aeterna Non Caduca tattooed upon his chest.